From left to right: Jennifer Kates, Robert Newman, Loyce Pace, Peter Mamacos, J. Stephen Morrison. Photo courtesy of CSIS. I am delighted to announce that Sara Allinder has been promoted to the position of Executive Director and Senior Fellow at the CSIS Global Health Policy Center. I am taking that step out of recognition of the truly exceptional role that she plays today, and to acknowledge also that she is assuming additional, important new responsibilities that will help carry us successfully into the future. As Executive Director, Sara’s core responsibilities will be to ensure the sustainability and stability of GHPC programs, become an influential policy voice on US policy on HIV, and work in close collaboration with me to expand GHPC external partnerships. On October 11, GHPC co-hosted with the CSIS Global Food Security Project a public event to launch their report from a recent joint research trip to Uganda and discuss how nutrition fits as a priority within U.S. development assistance policy and global strategies. Efforts to improve nutrition are among the most transformative and cost-effective interventions in global health and food security. Affecting one in three people globally, malnutrition is inherently intertwined with other pressing health and development challenges. As the single largest donor to global nutrition efforts, the United States plays a critical role in addressing malnutrition and advocating greater global support. Uganda, as a focal country of U.S. nutrition, health, food security, and agriculture initiatives, provides a specific lens through which to assess U.S. support and global opportunities for advancing nutrition. Speakers included Dr. Alma Crumm Golden, Senior Deputy Assistant Administrator, U.S. Agency for International Development (USAID); Dr. Robert Mwadime, Chief of Party, USAID Integrated Community Agriculture and Nutrition Activity (ICAN), Abt Associates, Uganda; Dr. Meera Shekar, Global Lead, Health, Nutrition & Population, World Bank. Kimberly Flowers, Director of the CSIS Global Food Security Project and Humanitarian Agenda, provided opening remarks. Sara M. Allinder, GHPC Executive Director & Senior Fellow, gave an overview of the report findings and moderated the panel discussion. Watch a video of the event here. 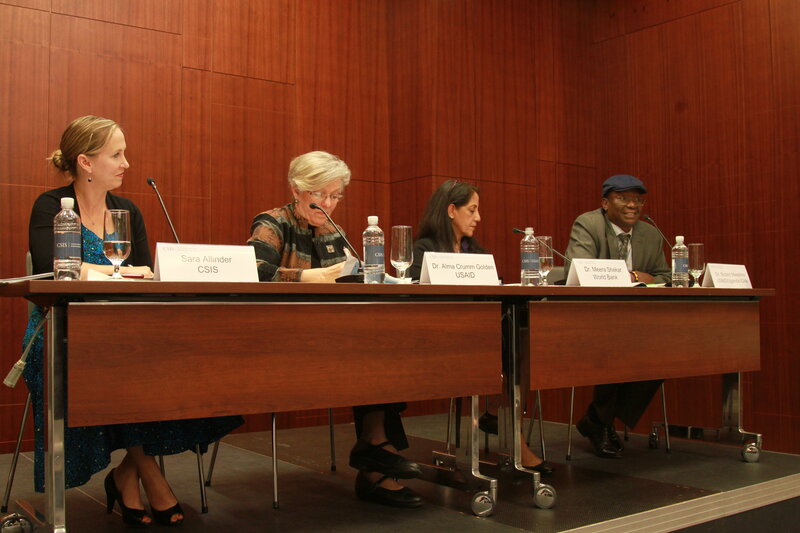 On October 10, GHPC co-hosted with the Kaiser Family Foundation a public session focused on the outcomes of the U.N. General Assembly’s high-level meetings on ending tuberculosis (TB) and on the prevention and control of noncommunicable diseases (NCDs). This event featured global health experts’ takeaways from the lead up to the meetings and the meetings themselves. For TB, they focused on the future of global financing to accelerate efforts to end TB, reflections on the political declaration on TB to be endorsed by heads of state, and actions by the TB community to reach the ambitious goals of the End TB Strategy. For NCDs, they discussed conclusions emerging from the review by Heads of State of progress achieved in reducing the risk of dying prematurely from NCDs, as well as an analysis of the status of collective efforts to accelerate global action. I moderated the panel that included Eric Goosby, UN Special Envoy on Tuberculosis (via video conference); Jennifer Kates, Vice President and Director, Global Health & HIV Policy, Kaiser Family Foundation; Peter Mamacos, Director, Global Health and Development, National Security Council; Loyce Pace, President and Executive Director, Global Health Council; and Robert Newman, GHPC Senior Associate. Watch a video of the event here. We will be posting two commentaries by Robert Newman with his takeaways and next steps from the respective meetings shortly. Please check our GHPC program page here . In a private session on October 2nd, members of the CSIS Commission on Strengthening America’s Health Security reconvened for the first time since the Commission launch in April. We reviewed the work done over the past six months and looked ahead to new work steams, which will develop into the Commission’s ten-year vision for health security. For more information about the Commission meeting, please view the corresponding press release. The theme of this year’s Atlanta Summit on Global Health was “Health Resilience & Natural Disasters”. This half-day summit focused on the public health effects of natural disasters, and I chaired a discussion on the health impacts of Hurricane Maria in Puerto Rico, which featured Dr. Carlos Santos-Burgoa of George Washington University, lead author of the report "Ascertainment of the Estimated Excess Mortality from Hurricane María in Puerto Rico". 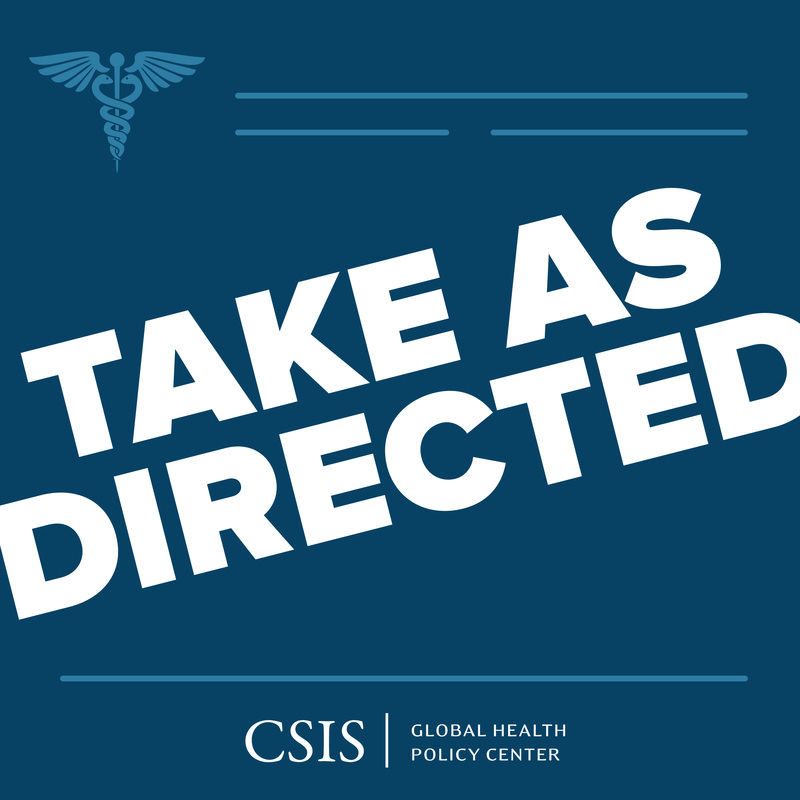 In this episode of Take as Directed, I am joined by Dr. Robert Redfield, Director of the U.S. Centers for Disease Control and Prevention (CDC). Since assuming his position as CDC Director in March of this year, Dr. Redfield has led the effort to enhance the CDC’s role in the continuing polio endgame. In part one of our two-part conversation, he discusses the complexities of the polio endgame, and shares what he believes to be the CDC’s most significant contributions to this global effort. In part two, with Dr. Redfield addresses what he calls “the public health crisis of our time” – the ongoing opioid epidemic. Combating the opioid epidemic has proven to be a challenge with a multitude of complexities, and Dr. Redfield shares his thoughts on where we are in the arc of this epidemic, the gaps that exist in treatment and recovery services, and the dangers of stigma in the midst of a public health crisis. In this episode of Take as Directed, I am joined by Gabrielle Fitzgerald, founder and CEO of Panorama, a Seattle-based action tank dedicated to solving global problems. Gabrielle discusses the main points of a British Medical Journal piece she recently co-authored, Global epidemics: How well can we cope?, which addresses the gaps that remain in the global capacity to respond to outbreaks from various standpoints such as financing, research and development, and knowledge sharing. On this episode of Take as Directed, I speak with Dr. Eric Goosby, the current U.N. Special Envoy on Tuberculosis, to share his hopes and expectations for the first-ever UNGA high-level meeting on TB, and its potential as an important step towards realizing the WHO End TB Strategy. After three years of dialogue in advance of this historic event, the meeting aimed to accelerate efforts in ending TB, and resulted in a Political Declaration on TB endorsed by heads of state. In this episode of Take as Directed, I speak with Dr. Peter Salama, Deputy Director General of the World Health Organization and Director of the Emergency Programs, to get his inside look at how the response team is navigating the complex dynamics of the highly dangerous outbreak of Ebola in eastern Democratic Republic of the Congo (DRC). This particular outbreak poses unprecedented challenges to emergency responders as the first ever one to occur in an active warzone. The response has had remarkable mobilization and promising achievements thus far, with successful vaccination campaigns, and a constant readjustment of strategies and resource allocation to best contain the virus. However, six weeks into the response (at the time of recording), the outbreak sits on the edge of some of the most insecure and inaccessible areas of the country, where the virus could potentially wreak terrifying levels of devastation. Upcoming Episodes include: Peter Sands, Executive Director of the Global Fund to Fight AIDS, Tuberculosis, and Malaria; and Dr. Robert Mwadime, an experienced nutrition expert and Chief of Party based in Uganda. On Thursday, October 25 from 2:00 to 4:00pm, the CSIS Global Health Policy Center will host a conversation with Thomas J. Bollyky on his new book, “ Plagues and the Paradox of Progress: Why the World is Getting Healthier in Worrisome Ways”. This is the first in a series of conversations intended to spotlight new thinking on health security, presented by the CSIS Commission on Strengthening America's Health Security. Registration details will be disseminated next week. The health realities of North Korea are bleak, and are an understudied part of the larger problem of the increasing chance of instability on the Korean peninsula. North Korea has an exceptionally high rate of multidrug resistant tuberculosis (MDR-TB), an estimated 42% of its population is undernourished, and 3 in 10 North Korean citizens, at the least, are stunted. On October 29, the CSIS Global Health Policy Center will host a public event to screen an 18-minute video on these pressing health security issues, which are threats to internal and regional stability, titled “ The Gathering Health Storm in North Korea”. Following the screening, we will hear from policy experts and humanitarian relief providers who have worked on the ground in North Korea. This event is presented by the CSIS Commission on Strengthening America's Health Security. Registration details to follow. GHPC is hosting a half-day conference focusing on novel approaches and innovative ideas for the improvement of equitable vaccine delivery worldwide. Over the last decade, the global health community has focused on ensuring low-income countries are able to purchase vaccines and introduce new products into their immunization systems. While the effort has paid off in many areas, coverage rates have stagnated in recent years. Speakers will focus on specific strategies, technologies, and data needed to target disparities in vaccine coverage, speaking particularly to context-specific interventions that seek to overcome barriers to access in disordered and fragile settings. The conference will also provide a forum for robust conversation around the need for continued U.S. and multilateral engagement through vaccine purchases and additional investments to improve immunization rates and strengthen immunization systems writ large. Registration details to follow. We are hiring a Fellow (or Associate Fellow at a more junior level) to support our HIV/AIDS portfolio and GHPC’s operational and substantive goals. We’re looking for someone with a Master’s and 5-7 years of substantive global HIV policy experience. The final position level will be determined based on the selected candidate’s experience. For more information, please visit the online job listing. The application period closes on October 19.